Our experience so far has had a lot of surprises. For one, we never expected to see the terrain we have. Today we traveled back from Nelspruit, S.A. to Manzini. 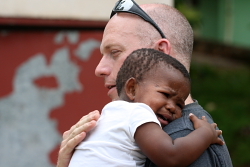 On the way we stopped at the ABC Baby Rescue Centre in a mountain town called Bulembu. We felt like we were in some place that was a cross between the forested rockies of Colorado and the lush green hills of Ireland. The story of ABC is absolutely amazing. A white South African couple said to the Lord…”Go ahead! Use us!”…and they had no idea what God would do next. First, their eyes were opened to the children in their town who were being abused, neglected and were dying. They began taking in kids who were in danger. To make a very long and intriguing story short…they have cared for 160 babies and have about 35 children under the age of 4 years old in their home along with another 12 or so that are their ‘first generation ABC’ers’ who range from 6 to 16. ABC stands for Abandon Babies for Christ (http://www.abcministry.org.za/). We spent most of the afternoon with the founders, Robyn and Gerry, up in this utterly unique community in the mountains. They now live and care for the babies out of two houses in an abandoned asbestos mining town. At one time, 5000 people lived in this town that had it’s own hospital, supermarket, golf course, school and movie theatre. However, the mine shut down and the town became a ghost town. Recently, a consortium of Christian businessmen bought the town and are attempting to build a business as well as a community. Their goal is to create a place that raises up the next generation of leaders who will lead Swaziland into a much better future. So, they have opened a lumber mill and a charcoal company. They are trying to open a furniture company and a bottled spring water company. In the meantime, they have gathered various Christian ministries, like Teen Challenge, ABC Centre and a few others to come and bring Christ to the village. We asked Robyn how they are funded and her answer was… “Jesus! He’s the best supporter around”. She then went on to explain how God just seemed to keep the 30,000 Rand a month ($4500 CDN) coming and meeting their needs. Talk about faith! Most of our afternoon was spent playing with the kids and holding the babies. Their stories were heart-wrenching. A baby abandoned on the steps of a hospital wrapped in plastic. A baby boy, boiled in water by his father. A baby girl, buried alive minutes after she was born…but rescued. Another baby boy, locked in a steel shack on 40C days when his mother went drinking. Little children, raped by their uncles because of the myth that the blood of a virgin will heal a man of AIDS. Yet the babies we saw were healthy, full of smiles and hope. In this place, even the babies like Zoe and Rachel, both HIV positive, have a future and are surrounded by people who work for and pray for their healing. Tomorrow we’re back to Pastor Peter’s Care Point for a church service and then we will visit two other Care Points. Monday we will visit 3-4 un-sponsored Care Points and hope to have made a decision on Riverwood’s Care Point by Monday night. On Tuesday and Wednesday we hope to begin caring for the people and becoming friends with those at Riverwood’s Care Point. There are many unpredictable things that happen in Africa (along with wild driving at 140km/hr and roads full of goats and cows with very long horns). Please continue to pray for our mission and for our little team…and be sure to take a few minutes to pray for Robyn and Gerry, who right now are caring for 42 children in their home! Thanks for the post Todd, and thank you especially for including the link to ABC ministries. Reading the children’s stories is pretty powerful stuff.As you go to the checkpoints earlier today, and tomorrow – strange to be writing eight hours off of CST – I pray that God would make it completely clear and obvious where He wants us to help.You see, as I imagine you in your journey, I think everywhere you look you see beautiful people who need something. How can we as mere humans make such an enormous decision. There are so many in need, and so many opportunities. I am confident in your leadership, and know that God will use you, and the church powerfully in His will.Remember I told you a while back you’re an Abraham pastor? Look around, you’re in Africa! The Lord has great things in store for his people. Yay God! Hello Auntie Carolyn & Uncle Todd,Wow, what an exiting trip! I’m so excited that my little “baggie-of-love” will soon be in the hands of the little girl I’ve been praying for in Africa. I got a bag and put a picture of me in it and a bear and so much more.I loved putting it together!I hope that the little girl that receives this gift from me will feel much love and hope. Please give her a hug from me:)I just want all of the kids there to know that they are loved and that Riverwood is praying SO MUCH for all of them. I can see by the pictures that it will be an experience that you will never forget.May God keep you safe in Africa, and may you have a safe trip home on Thursday.God bless all of you,Love,LaylaPS. Mom’s been following your every move, and filling us in every day:) She’s been praying that you get the sleep you need.